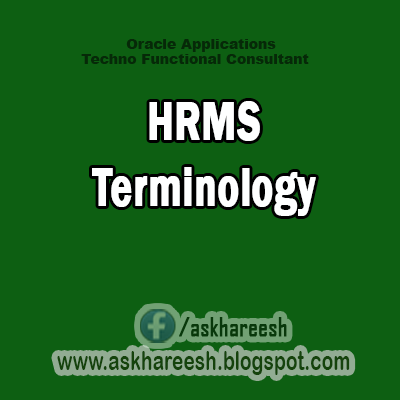 Database Item : An item of information in Oracle HRMS that has special programming attached, enabling Oracle Fast Formula to locate and retrieve it for use in formulas. Date Earned : The date the payroll run uses to determine which element entries to process. In North America (and typically elsewhere too) it is the last day of the payroll period being processed. Date Paid : The effective date of a payroll run. Date paid dictates which tax rules apply and which tax period or tax year deductions are reported. Date To and Date From : These fields are used in windows not subject to Date Track. The period you enter in these fields remains fixed until you change the values in either field. Date Track : When you change your effective date (either to past or future), Date Track enables you to enter information that takes effect on your new effective date, and to review information as of the new date. Default Postings : (iRecruitment) Default text stored against business groups, organizations, jobs, and/or positions. The default postings are used to create job postings for a vacancy. Department : In DBI for HRMS, the term Department has the same meaning as Organization. Dependent : In a benefit plan, a person with a proven relationship to the primary participant whom the participant designates to receive coverage based on the terms of the plan. Deployment : The temporary or permanent employment of an employee in a business group. Deployment Proposal : The entity that controls the permanent transfer or temporary secondment of an employee from a source business group to a destination business group. The HR Professional in the destination business group creates the deployment proposal using the Global Deployments function. Derived Factor : A factor (such as age, percent of fulltime employment, length of service, compensation level, or the number of hours worked per period) that is used in calculations to determine Participation Eligibility or Activity Rates for one or more benefits. Descriptive Flexfield : A field that your organization can configure to capture additional information required by your business but not otherwise tracked by Oracle Applications. Deviation : A change to the standard approver list is a deviation. Developer Descriptive Flexfield : A flexfield defined by your localization team to meet the specific legislative and reporting needs of your country. Direct Deposit : The electronic transfer of an employee's net pay directly into the account(s) designated by the employee. Discoverer Workbook : A grouping of worksheets. Each worksheet is one report. Discoverer Worksheet : A single report within a workbook. A report displays the values of predefined criteria for analysis. Distribution : Monetary payments made from, or hours off from work as allowed by, a compensation or benefits plan. Download : The process of transferring data from the Oracle HRMS application to your desktop (the original data remains in the application database).